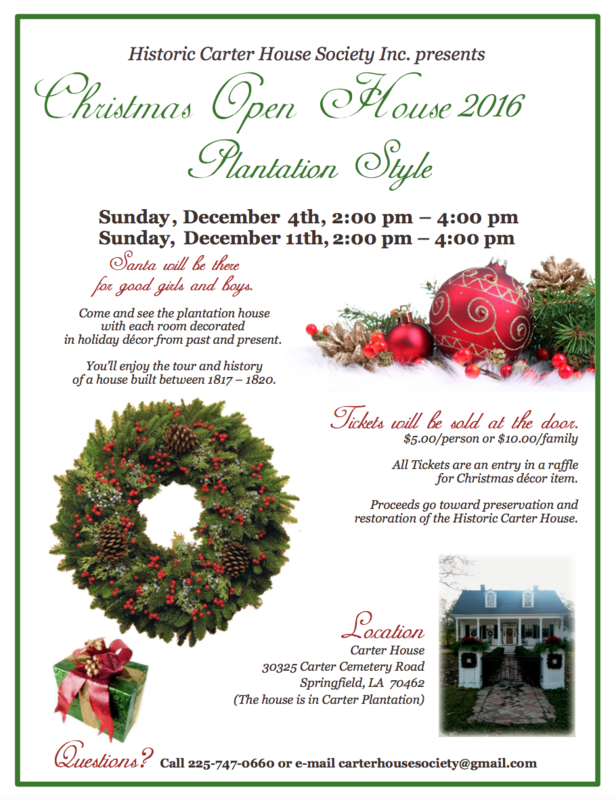 Christmas Open House Plantation Style 2016 | Historic Carter House Society Inc.
You are invited to the Christmas Open House at the Carter House on Sunday, December 4 and Sunday, December 11 at 2:00 PM – 4:00 PM both days and are hosted by the Historic Carter House Society Inc. (HCHS). Rooms will be decorated in holiday décor from past and present and Santa should be there for good girls and boys! Parents and grandparents don’t forget to bring your camera to take that special picture with Santa. You will have the opportunity to tour the house and learn some history about the plantation. The Carter House is on the National Register and was built 1817 – 1820 so it is quite a piece of history for the community and Livingston Parish. Tickets sold at the door cost $5.00/person or $10.00/family and each ticket will be entered in a drawing for a door prize. Proceeds go toward restoration work and repairs needed from damages caused by the August 2016 Flood of the Carter House and properties. Even though the house did not get water in it there was damage to the AC duct work hung under the house and one of the three AC units no longer functions and will need to be replaced. The guest house flooded and will require renovation before another tenant will be able to occupy the house. The loss of the tenant has meant the loss of a revenue stream so the property needs to be repaired as soon as possible. The Carter House is the only plantation in Livingston Parish and it is a real education experience to take a tour. Our organization encourages children to visit so they can learn about the history of the house as well as a little bit about how people lived back in the 1800’s. The house is located in Carter Plantation, 30325 Carter Cemetery Rd., Springfield, LA 70462. To schedule a tour or find out about scheduling an event or to take photographs at the house, please call 225- 747-0660, e-mail carterhousesociety@gmail.com. Also, for additional information, please be sure to check out the website http://historiccarterhouse.org/.